Despite disclosure rules adopted in 2012, 401(k) fees are still very murky and often overlooked by retirement plan participants. Hidden, seemingly innocuous fees can add up to hundreds of thousands of lost dollars over time. Employers are required to have fiduciary responsibility over their company’s retirement plans, including full disclosure of fees, expenses and investments. Using a financial advisor who’s authorized as a 3(38) fiduciary can greatly reduce your liability if you’re an employer. Whether you are a business owner, retirement plan sponsor or an individual participant diligently saving for a secure financial future, chances are you don’t have a clear picture of the fees you are paying for your retirement plan. Although new disclosure rules were adopted in 2012, 401(k) fees are still very much a mystery and often overlooked by retirement plan participants. To make matters worse, fees that sound nonmaterial on the surface can have the potential to add up to hundreds of thousands of lost dollars over time. Take a look at this primer from the U.S. Department of Labor. Assume that you are an employee with 35 years until retirement and a current 401(k) account balance of $25,000. If returns on investments in your account over the next 35 years average 7 percent a year and fees and expenses reduce your average returns by 0.5 percent. Then your account balance will grow to $227,000 at retirement, even if there are no further contributions to your account. If fees and expenses are 1.5 percent a year, however, your account balance will grow to only $163,000. 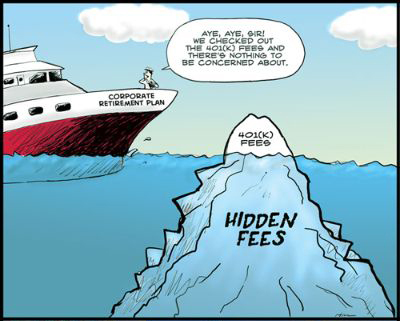 The 1 percent difference in fees and expenses each year would reduce your account balance at retirement by 28 percent. The above difference equates to having $64,000 less in your account at retirement, and that’s if your 401(k) has only $25,000 in it. Imagine how much more you could be out-of-pocket if you had a larger balance and saved aggressively. The number could literally be hundreds of thousands of dollars. Monitor investment options and service providers once selected to see that they continue to be appropriate choices. As an individual participant however, it’s certainly possible that you didn’t know you were paying fees at all. Therein lies the problem. A 2013 survey by the Life Insurance Marketing Research Association (LIMRA), showed that almost one in four workers believed they pay nothing for their plans. As the old saying goes, If it sounds too good to be true, then it probably is. There is no free lunch and your 401(k) certainly isn’t free either. Investment fees. In the mutual fund world this is referred to as an “operating expense” or “expense ratio.” This fee is what you pay for ongoing operations of the investment. It is typically stated as a percentage. Plan administration fees. These are the fees associated with the cost of providing and maintaining your 401(k) platform. They may be included in the investment fees or charged separately. Individual service fees. These fees are usually a la carte and are associated with services, like loan processing or rebalancing your allocation. Although these fees can be thousands of dollars each year, many individuals are simply not aware of them because they never have to write a check for them. Instead, they are taken directly out of your account and you may not even notice. This is not only a serious matter as a plan participant, it’s even more important to understand the details as a business owner. The disclosure rules require the plan’s administrator (employer) to provide plan investment and fee information to participants. As an employer and fiduciary, you have a specific legal obligation to consider the fees and expenses paid by the plan. The degree of fiduciary liability carried by the administrator depends greatly on the structure of the 401(k) plan arrangement. If you’re an employer, you can greatly reduce this liability by using a financial advisor who can act as a 3(38) fiduciary. As a Registered Investment Advisor (RIA) and 3(38) Investment Manager, Independence Advisors helps plan sponsors mitigate fiduciary risk so they can focus their time and effort on running their businesses. A 3(38) fiduciary can only be (a) a bank, (b) an insurance company, or (c) a registered investment adviser subject to the Investment Advisers Act of 1940. Not sure if your advisor is a fiduciary? Here’s a quick litmus test: If your plan pays commissions to a brokerage then you are not getting 3(38) fiduciary coverage. In one plan that we recently evaluated, we reduced the plan-level costs by more than $100,000 a year, and dramatically improved the cost structure and diversification at the participant level. We accomplished this without sacrificing investment performance by using low-cost passively managed mutual funds and by providing “model” portfolios that are professionally managed. If you’d like to learn more about this topic please contact me (610-695-8070) for a complimentary analysis of your retirement plan.